Today marks the launch of the UCL Summer School 2019 website. Between July 1 and August 9 2019, the Summer School will offer the opportunity for students from around the world to study at UCL for either three or six weeks and gain credit towards their degree programmes. While much of the 2018 module offering remains, a considerable number of new modules, ranging from Bioscience and Society: Public Engagement, Policy and Funding to Brexit: Political Tensions, Economic Challenges, have been added. 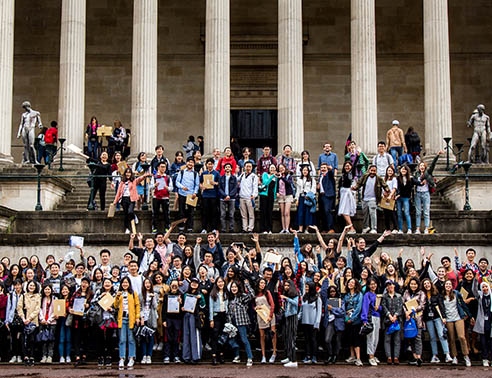 This summer 529 students, representing 52 nationalities, from over 240 universities around the world enrolled on the programme and left UCL with associate-alumni status. For the first time, every UCL faculty was represented by at least one module. The UCL Summer School is primarily aimed at undergraduate students (completion of at least one year of undergraduate study is a pre-requisite) but the programme also attracts a small number of postgraduates who wish to develop their knowledge in a particular subject area. Many students who enrol do so with the intention of transferring credit back to their home institution, whilst others simply join the programme to experience a taste of life at UCL or to help them decide on whether to pursue postgraduate study at UCL. This year, 82% of surveyed students said they would consider UCL for a graduate programme and 95% of those students said their experience on the UCL Summer School has made that more likely. Rhod Fiorini, Head of the UCL Summer School, said "The Summer School has seen phenomenal growth over the last few years and this looks set to continue as we have already received a good level of interest in next year's programme. These enrolment numbers and the high levels of student satisfaction reflect the efforts of all involved with the programme, and we are confident that we now have a very solid platform on which we can continue to build, showcasing the full range of UCL's academic specialisms. Today we launch Summer School 2019, but we will soon be planning for 2020 so I would encourage anyone interested in developing a module for the Summer School to contact us to discuss it further".